Jiggle Jungle is one of the five continents of the Shake Dimension and the fourth one explored in Wario Land: Shake It! It is jungle-themed, with almost every area filled with Amazon-like plants, and even rivers are found. 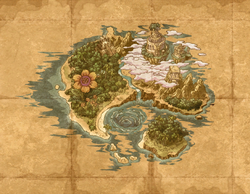 There are two normal levels in a jungle, the other two normal levels are underwater and in the sky. When Queen Merelda was held hostage, Bloomsday took her role to rule this continent. This page was last edited on October 12, 2017, at 06:36.